This was not without problems however. Sometime after starting the second deer, I noticed that the dye lot was different. The deer on the right is actually a lot brighter than the one on the left. I am hoping that it is not too noticeable. I can't help but think these look like cartoon deer! I don't think they had cartoons back in Harriot's day, but these guys certainly have a Disney-esque quality to them! I think it's the eyes. One of them turned out to be a bit larger than the other. Not sure how that happened. Oh well. I am certainly not going to do them over again! I started working on the flowers. They are also done freestyle. I am not having any easier time with these, but atleast, the vines and leaves aren't quite as obvious when you mess up! I have a ways to go. I have the center floral motif, and then the left motif to do yet. After that, I will go on to do the grass. On the home front, things have been a bit gloomy here. We have had a terrible problem with hawks! We have had a total of 5 attacks. Three chickens were killed, one managed to get away, and one seems to be traumatized. She will not come out of the shed, and has stopped laying eggs. This last attack was by a pair of giant red-tailed hawks! Poor Sally! She was such a happy little thing! I can't think of anything more terrifying than some unknown peril dropping out of the sky to kill you! We are hoping to get a few more chicks this spring, but they will not be laying eggs for some time. We are four hens down now, so it has cut into our egg production. We need some SPRING here, and soon! I normally don't mind the winter, but this year, here in NY, it has just been relentlessly cold and windy! Brrrrr! Hopefully Spring will not be too far away! I love your progress!!!! Wow! It's wonderful! It's hard to see that the right deer is brighter -- I'm sure it's fine. Sorry about your chickens. Such a bummer. And yes, I so agree about winter. I'm sick of it already. lol! Your progress is great. The sampler is very pretty. So sorry about your chicken! !I agree, it must be so scary to have a monster swooping down from the sky! Harriot is amazing Erica. Keeping hens is very rewarding but there are so many perils for them. In the UK it is primarily foxes that take them but I have seen a bird of prey swoop down before with a new born lamb. Your progress is great. 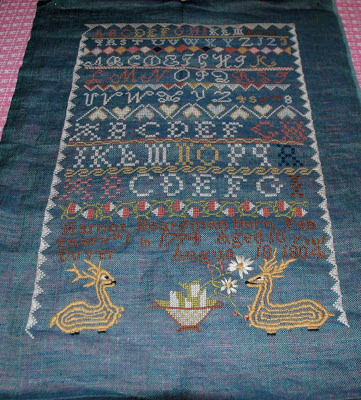 The sampler is very pretty. Lovely progress on your sampler! it doesn't matter if your deer are slightly different in colour, isn't that what happens in real life too? :-) Sorry about your chicken - falcons are amazing animals, but they should definitely stay away from your poor chickens! Great progress on Harriot, it's looking gorgeous. Sorry to hear that you've lost more chickens. Do you have an enclosed run for them? Your deer look magnificent, well done.